Be the first to share your favorite memory, photo or story of Sister Marilyn. This memorial page is dedicated for family, friends and future generations to celebrate the life of their loved one. 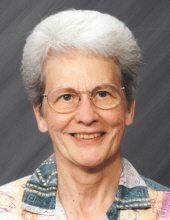 Sister Marilyn Kraus, CHM, 91, died at 10:36 a.m. Sunday, March 24, 2019, at LaHarpe Davier Health Care Center in LaHarpe, Illinois. Born July 26, 1927, in Keokuk, Iowa, the daughter of John and Minnie (Bruegger) Kraus. She graduated from Sts. Peter and Paul High School in Nauvoo in 1945 and Marycrest College in Davenport, Iowa in 1949. She became a member of the Congregation of the Humility of Mary in September, 1948, making perpetual vows in July, 1954. She taught for twenty years in high schools in Ottumwa and Marshalltown, Iowa, and at Ottumwa Heights College in Ottumwa. She was granted a MS degree in biology from the University of Notre Dame, a Master of Public Health from the University of Michigan, Ann Arbor, and a MA degree-emphasis on medical librarianship from the University of Missouri, Columbia. She received several National Science Foundation grants for summer study at various universities throughout the country. In September 1973 she was appointed Chief, Medical Library Services at the Department of Veterans Affairs Medical Center in Iowa City, Iowa. In August, 1995 she returned to Nauvoo and helped in the family businesses. Surviving are two nephews: Daniel L. Kraus of Nauvoo, Illinois and Jonathan Kraus of Sunrise, Florida; five nieces: Cathy Crynes of Lakewood, Colorado, Deborah Allen of Nauvoo, Illinois, Diane Hauf of Annapolis, Maryland, Rosemary Flanagan of Canton, Georgia, Elaine Morthorst of Walkersville, Maryland and several grand-nieces and nephews. She was preceded in death by her parents; one sister: Dorothy Morthorst; one brother: Elmer J. Kraus and two nephews: David and James Kraus. Sister Marilyn was a member of Sts. Peter and Paul Catholic Church. She was a member of the Nauvoo Historical Society and served two years on the Board of Directors. She enjoyed plants and could be found giving water and TLC to those in boxes in front of the company businesses. Friends may call from 12:00 noon to 6:00 p.m. Wednesday, March 27, 2019, at Schmitz - Banks and Beals Funeral Home in Nauvoo, Illinois, where with family will receive friends from 4:00 p.m. to 6:00 p.m. that evening. The family will receive friends from 9:30 a.m. to 10:00 a.m. Thursday, March 28, 2019, at Schmitz - Banks and Beals Funeral home in Nauvoo. A Parish Rosary will be recited at 10:00 a.m. at the funeral home. A Mass of Christian Burial will be held at 11:00 a.m. Thursday, March 28, 2019, at Sts. Peter and Paul Catholic Church in Nauvoo with Father Tony Trosley as Celebrant. Burial will be at Sts. Peter and Paul Catholic Cemetery, Nauvoo. Memorials may be made in her memory to: Sisters of Humility, 820 W. Central Park Avenue, Davenport, IA 52804, Sts. Peter and Paul Catholic Church or School, P.O. Box 147, Nauvoo, IL 62354, or the Nauvoo Historical Society, 1380 Mulholland Street, Nauvoo, IL 62354. To plant a tree in memory of Sister Marilyn Kraus, please visit our Tribute Store. "Email Address" would like to share the life celebration of Sister Marilyn Kraus. Click on the "link" to go to share a favorite memory or leave a condolence message for the family.